This is part six in our series of blog posts which looks more closely at each gemstone I use in Hasso bike chain cufflinks. This post is quite a treat, looking at the very unique tanzanite cufflinks. In this post I’ll go into more detail about why I chose to work with these distinctive gemstones, what I find inspiring about them, when tanzanite jewellery might be an excellent gift, and what you can wear with tanzanite cufflinks. If you want a more in-depth post about the tanzanite gemstone itself, head over to read the tanzanite birthstone blog post. We use a created Tanzanite, which is grown in a lab and is actually a cubic zirconia. The reason for this is firstly because it is easily the most stunning cubic zirconia I’ve ever seen and I really wanted to include it in the collection, and secondly, because by using a created gemstone it means we can offer the cufflinks at a lower price. If you want a pair of bike chain cufflinks with mined Tanzanites, then you can just get in touch by email and I’m happy to go through the options as there are many colours and qualities of tanzanite to choose from. To give you an idea of an approximate starting price, the genuine tanzanite gemstones will add around £80 to the price of the cufflinks. Please note, this is an estimated starting price and is in addition to the cufflink prices listed on the shop pages, it is only an estimate based on basic genuine tanzanite. Tanzanite is a December birthstone which means tanzanite gifts are great Sagittarius or Capricorns. It’s also the 24thwedding anniversary stone. You can find more information in the tanzanite birthstone blog article. 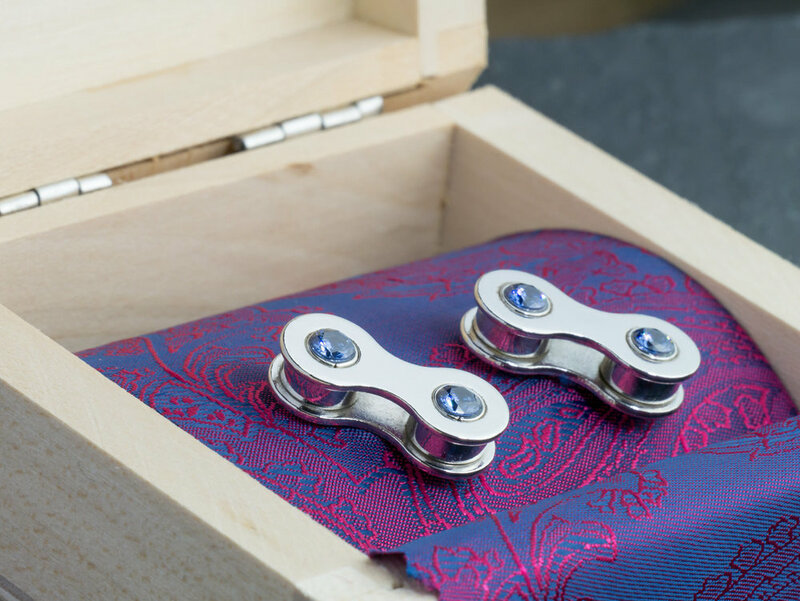 The tanzanite bike chain cufflinks are made in the UK, between Newcastle and the south coast. They are finished (plated) in silver, rose gold or gold. The cufflinks look very intriguing because the stone is quite unusual. The created tanzanites used in the cufflinks is a deep blue which glitters with green, red and white. These coloured reflections make it look very distinctive. The cufflink rests in a deep blue illusion of formality, like a navy suit blazer, then there’s a cheeky sparkle of green or red and the cufflink suddenly reveals its true character. When I first saw these created tanzanite stones, I knew they’d make the some really unique cufflinks. If I was to pick a favourite gemstone that shows off all 3 metals, it’d be these. The strong colouring of the stone makes it stand out with both the golds and silver cufflinks. The silver tanzanite cufflinks are very popular as are the gold ones. Tanzanite cufflinks bring an exquisite feeling to whatever you wear. The bold colour of the gemstone gives a solid confident look to any shirt. Wearing a formal shirt with cufflinks the blue gemstone proves how adaptable it is in either silver or gold. In less formal business casual or casual wear the cufflinks brightness adds sparkle and charm.